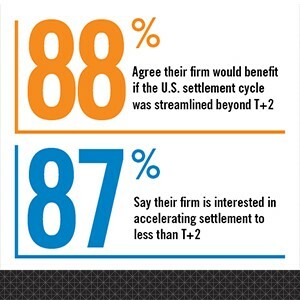 A majority of survey respondents said their firms would benefit from a move beyond T+2 and that they were interested in accelerated settlement, according to the results of an informal poll of visitors to the T+2: What’s Next microsite conducted by The Depository Trust & Clearing Corporation (DTCC) in February. In its white paper, Modernizing the U.S. Equity Markets Post-Trade Infrastructure, DTCC proposes “accelerated time to settlement” and “settlement optimization” to potentially achieve settlement of even less than T+1. Accelerated time to settlement and settlement optimization build on existing DTCC capabilities while enhancing liquidity, reducing risk and improving straight-through-processing (STP). The traditional approach to shrinking the time gap between trade and settlement has been to maintain the current process but reduce calendar days; this is how the industry moved to T+2 from T+3 in September. One proposal on the table is to move settlement of eligible equity trades from the afternoon of settlement date to the morning before market open, which means an entire market day of settlement exposure could be eliminated without removing a calendar day. From Where We Stand, DTCC has an informed perspective on how to mitigate risk, increase transparency, provide greater efficiencies and strengthen the security of the financial markets. To learn more about our perspective for what’s next after T+2 and other important industry topics click here.